Can Pregnancy Trigger Celiac Disease? Many women find they develop celiac disease symptoms following a pregnancy, and research does show there's a tentative link indicating pregnancy may play some role in the development of celiac disease. However, that doesn't mean pregnancy can cause celiac disease. At most, pregnancy might contribute to the development of the condition in someone who's already predisposed to it... and there's a lot of research that needs to be done before science reaches that conclusion. 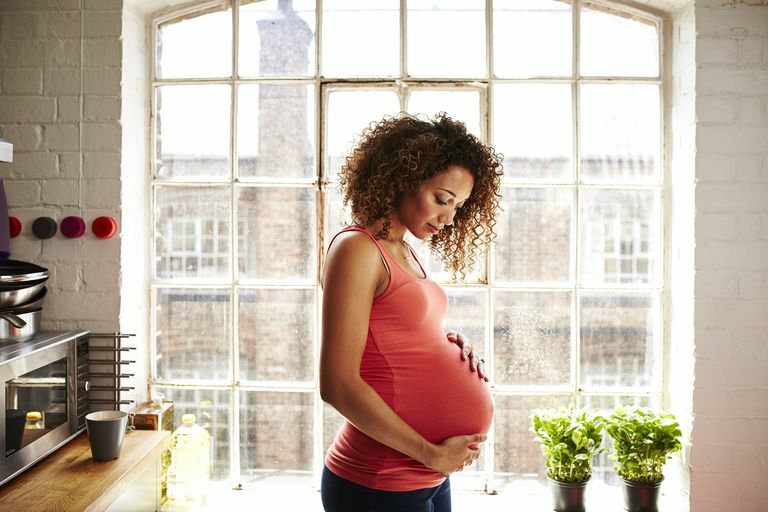 Here's what you need to know about how pregnancy might affect your odds of developing celiac disease. Celiac Disease and a "Trigger"
Some scientists believe celiac disease requires a "trigger." When these scientists talk about a trigger, they mean a health or life event that causes your body to suddenly reject gluten, even though you've likely been consuming gluten-containing foods for your entire life with few or no problems. Speculation on possible celiac disease triggers has ranged from severe gastrointestinal conditions—a bad bout of food poisoning, for example—to emotional issues such as divorce or job loss. But one of the most common possible "triggers" mentioned involves pregnancy: Many women have reported that they developed severe celiac disease symptoms shortly after being pregnant and giving birth. So could there be a connection? Well, maybe. Research does show a tentative link indicating pregnancy may play some role in celiac disease. Most women are diagnosed with celiac disease after at least one pregnancy—in fact, a comprehensive Italian study on the reproductive effects of celiac found that 85.7% of women received their celiac diagnosis following their first pregnancy. But that statistic doesn't necessarily mean anything. Many women have their first baby in their 20s or early 30s, and celiac disease diagnosis tends to occur a little later in life—in your late 30s, 40s or even 50s and beyond. Delays in diagnosis (even in Italy, which tends to be more celiac-aware than some other countries) could mean the women in the study actually had celiac long before they learned they did. There's some evidence for this. Half of the celiac women in the study said they had experienced menstrual cycle disorders potentially linked to celiac disease before they experienced any other symptoms. And, women who eventually were diagnosed with celiac disease were twice as likely as other women to experience pregnancy complications, which also have been linked to celiac disease. Both of these issues could indicate the women potentially were suffering from early, undiagnosed celiac disease at the time of their first pregnancies, but they and their doctors didn't recognize the symptoms. Could Stressful Pregnancy Lead to Celiac? Other researchers have attempted to determine if stressful "life events" can somehow be involved in triggering celiac disease. In a study published in the medical journal Nutrients, another team of Italian researchers looked at people diagnosed with celiac as adults, comparing them to a control group made up of people with newly diagnosed gastroesophageal reflux disease (GERD). The researchers found that those with celiac disease were statistically more likely to have had a "life event"—such as a health problem, change in financial status or death in the family—prior to their diagnosis. On further analysis, the study found that women with celiac disease were especially likely to have had such a life event occur... and pregnancy seemed to count as a life event. In fact, 20% of celiac women who experienced a pregnancy prior to their celiac diagnosis said the pregnancy was stressful, while none of the women in the control group made such an observation. The researchers speculated that pregnancy could be stressful for a woman with undiagnosed celiac disease because being pregnant can unmask such problems as anemia and celiac-related malnutrition. However, they delved further into the data in an attempt to determine if this was true and concluded that women with celiac disease still seemed more sensitive to stressful situations than the women with GERD. So can pregnancy trigger celiac disease or not? We still don't know, unfortunately. It's possible that pregnancy—especially a stressful pregnancy—might contribute to the development of celiac disease. The authors of one study alluded to that, noting that "psychological stress has been repeatedly reported to increase disease activity in gastrointestinal diseases." However, celiac disease can remain below the radar and undiagnosed for many years. It's possible that in some women, pregnancy (and maybe some celiac-related nutritional deficiencies exacerbated by pregnancy) can cause so-called silent, or asymptomatic, celiac disease to become symptomatic, leading to an eventual diagnosis. Either way, much more research is needed to determine what role, if any, pregnancy plays in the eventual diagnosis of celiac disease. Martinelli D. et al. Reproductive life disorders in Italian celiac women. A case-control study. BMC Gastroenterology. 2010 Aug 6;10:89. doi: 10.1186/1471-230X-10-89. Ciacci C. et al. Life Events and the Onset of Celiac Disease from a Patient's Perspective. Nutrients. 2013 Aug 28;5(9):3388-98. doi: 10.3390/nu5093388. Can Stress Actually Trigger Celiac Disease?